Review originally published in Shelf Awareness for Readers. Reprinted here with permission. In response to the anti-clutter movement, Jennifer McCartney encourages us all to embrace our messy lives and make peace with our stuff. 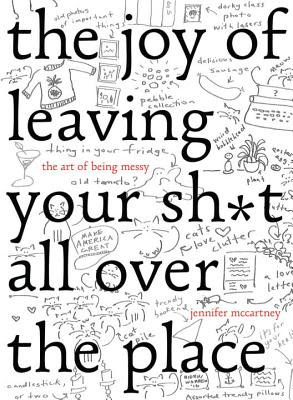 Jennifer McCartney's The Joy of Leaving Your Sh*t All Over the Place is a satirical response to the minimalist movement--most notably, the "KonMari" method touted in 2014's bestselling The Life-Changing Magic of Tidying Up. "Break free from the bonds of tidiness," writes McCartney (Cocktails for Drinkers), "and triumph over the boring faces of uniformity and predictability. Every tidy home looks the same... but a messy home, now that's a better way to live." This tongue-in-cheek approach to messiness continues throughout the book, as McCartney scoffs at the idea of thanking our socks for their service; mocks the thought of books as clutter; and encourages readers to collect at least a dozen cute dog sweaters for the numerous puppies in our homes. The Joy of Leaving Your Sh*t All Over the Place takes the mockery a bit far at times, but McCartney's approach to keeping every item ever owned is ultimately no more extreme than the minimalist idea of getting rid of every item that serves no functional purpose (no matter its what-if or sentimental value). McCartney invites readers to embrace their clutter, giving permission to laugh at the notion of cleaning house and accept the imperfections of a non-minimalist lifestyle. "It's about living now with what we have and giving ourselves permission to be messy, slightly untidy, busy-as-f*ck normal human beings." The Joy of Leaving Your Sh*t All Over the Place may not be for everyone, but those looking for permission to keep at least some of their belongings will delight in the absurdity of McCartney's work.